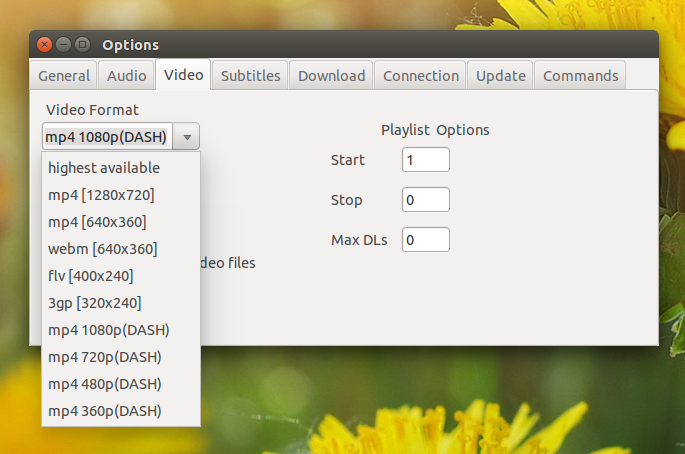 Youtube-dlG is a multi-platform GUI for the popular command line video download tool `youtube-dl`. The GUI lets you download multiple videos at once, can automatically convert downloaded videos to audio, lets you select the video quality and more. youtube-dl is a command line video downloader which, despite what its name suggests, supports downloading videos not only from Youtube, but from hundreds of websites, it can extract the audio automatically, supports downloading playlists, downloading and embedding subtitles into videos and much more. supports specifying command line arguments that are passed to youtube-dl. Youtube-dlG (or youtube-dl-gui) doesn't offer access to all the youtube-dl features (there are so many, it's almost impossible - I'd say -, to fit them all into a single UI) but it does offer access to most basic features which should be enough for most users. By default, the videos are downloaded in your home folder but you can change that from the application options. It's important to not that selecting "highest available" in the Youtube-dl-gui video options, the application will download the highest available video format that's not DASH, which usually means 720p. If you want to download 1080p Youtube videos, select "mp4 1080p(DASH)" and make sure to also select "DASH m4a audio 128k" under "Dash audio". If you don't want to add our PPA, you can download the deb from HERE and install it manually. Once installed, launch "YouTube DL GUI" from the menu / Unity Dash. Arch Linux users can install Youtube dlG via AUR. To download the source code, Windows binaries, report bugs, etc., see the youtube-dl-gui GitHub page.